Home→Allgemein→Use your VAS 5054A Adapter also for mobile vehicle diagnostics with CAR ASYST! 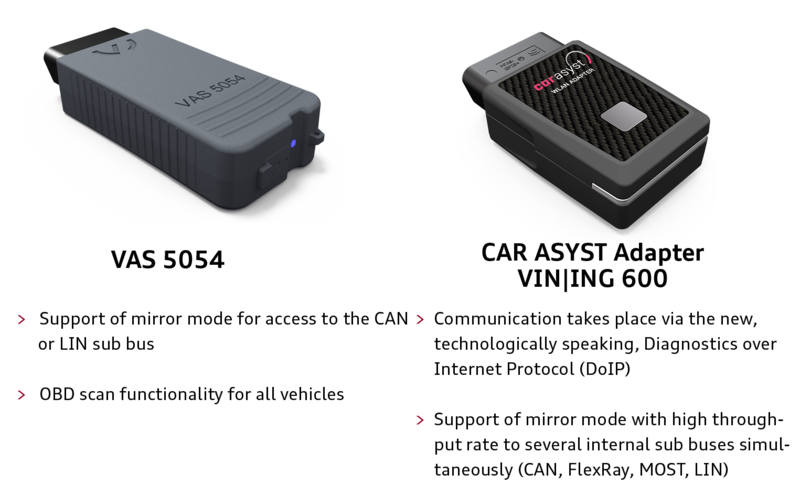 With your VAS 5054 adapter you can use CAR ASYST, the tool for mobile vehicle analysis officially approved by Audi. Thus, it immediately provides you a mobile solution for vehicle diagnostics and tests on your existing Android-Smartphone or -Tablet. Or opt now for the full range of CAR ASYST features along with the CAR ASYST Adapter VIN|ING 600 adapter. If you have any questions, don´t hesitate to contact us at car-asyst@softing.com.